White bread – a scrumptious bread which could be paired with diverse combinations or consumed as it is. 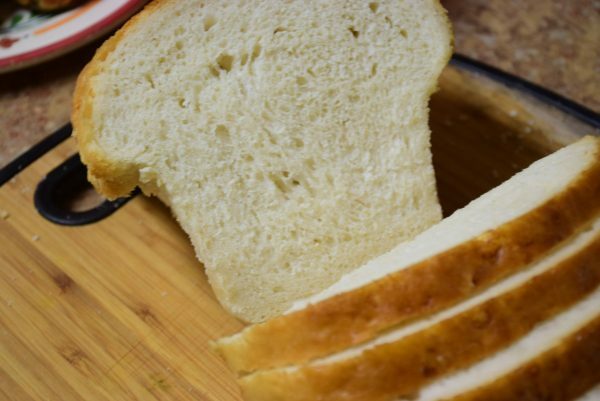 One of my friend’s(Pooja) weakness is this white bread. A soft-fluffy white loaf has always been my dream, since I visited the “Boudin” bakery in San Francisco in 2013. 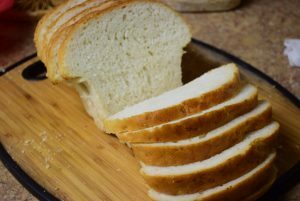 I have seen innumerable posts in the Foodies groups like “Chef at Large” and “Care and share” with these bread recipes. But I finally gather courage to try it out my way yesterday. Take a large bowl or tureen (paraat). Add flour to it. Heat 1/2 cup of water in microwave. Water should be just lukewarm (90 F – 110 F) . 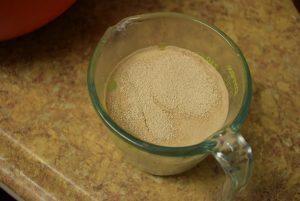 Add yeast in the warm water and allow it to rest for 5 mins. Also add sugar to this water. You may powder some sugar for this, since it dissolves quickly and does not intervene in the yeast proofing process. Also sugar works as a catalyst and fasten the proofing. Water shouldn’t be cold or too warm , or the yeast will either not activate or it might die before proofing. Once you see the bubbled water risen , add it to the well in the flour. Mix this yeast mix and add more water (at room temperature) to form a soft dough. When the flour has come together in dough shape, mix oil with salt. Add this mixture in the same bowl. Roll your dough in it and knead it for 15-20 mins so that it becomes non-sticky. You can knead it the way you knead your “Roti’s dough” by punching in the holes created after flattening the dough . Or you may flatten it in a rectangle, dust some flour on the counter and then tuck the opposite sides in the center , then the next pair of opposite sides to the center and repeating the steps again. Cover the dough in the bowl with a wet towel and allow it to proof for 45 mins in a warm place. Take out the dough, knead it again on the floured surface for 5 mins. Rest it on the counter covered with a damp towel for 15 mins. 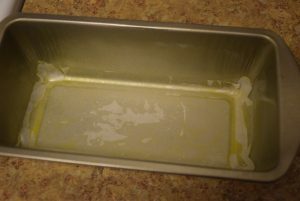 In the meanwhile , grease your bread tin (8″ by 4″ ) with butter or oil. Now uncover the dough, pat it with hands in an approximate rectangle of 7 ” by 6″. Pick up the longer seam flap from one side and place it on the rest of the dough. Now pick up the other long flap and place it over the folded seam. You have to three-fold the two layers over each other. Next start rolling the width of the dough and tuck it each time while rolling. In the end, tuck down the edges of the log thus obtained and place it gently in the well-greased baking tin with the seams facing down. Spread it with fingers in the whole tin by pressing it down. The more time you give it to rest, the more soft , porous and puffy the bread will be. So if you want , you can knead it and proof it for the second time in the tin like me. 😉 . 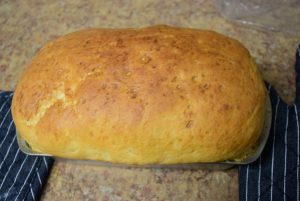 Else preheat the oven at 200 C (400 F) for 10 mins and brush the top of the well -puffed loaf with mixture of oil and milk. This brushing will give the loaf a golden brown color while baking. Place the loaf (in tin ) in the preheated oven for 30 mins for baking. Mine took exactly 28 mins . 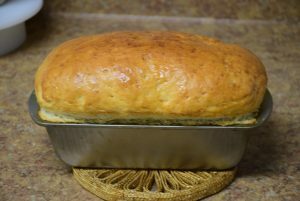 Take out the baked loaf from the oven and allow it to cool in the tin for 10 mins. It will be hard to touch when it is fresh out of oven. But don’t worry after cooling, it will turn into a soft spongy, bouncy white bread. 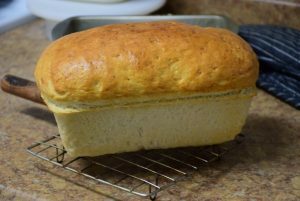 You may store the bread on the counter for 3 to 4 days in a long transparent clean plastic bag or arrange it back in the baking tin and cover it with fresh wrap. Enjoy it with morning tea in the form of a sandwich or smear it with butter. 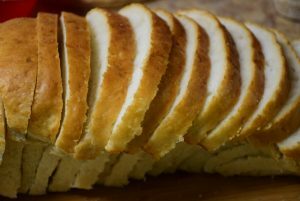 Since this bread does not contain any preservative or corn syrup , it might turn sour in taste in hot and humid weather. So store it in refrigerator covered like other breads for best taste. Hope you like this recipe and try it out in your kitchen too ! Take a large bowl or tureen (paraat). Add flour to it. Heat 1/2 cup of water in microwave. Water should be just lukewarm (90 F - 110 F) . Add yeast in the warm water and allow it to rest for 5 mins. Also add sugar to this water. You may powder some sugar for this, since it dissolves quickly and does not intervene in the yeast proofing process. Also sugar works as a catalyst and fasten the proofing. Water shouldn't be cold or too warm , or the yeast will either not activate or it might die before proofing. When the flour has come together in dough shape, mix oil with salt. Add this mixture in the same bowl. Roll your dough in it and knead it for 15-20 mins so that it becomes non-sticky. You can knead it the way you knead your "Roti's dough" by punching in the holes created after flattening the dough . 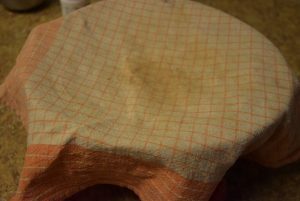 Or you may flatten it in a rectangle, dust some flour on the counter and then tuck the opposite sides in the center , then the next pair of opposite sides to the center and repeating the steps again. After about 45-60 mins , the dough would have doubled in size and volume. If it has not risen, give it more time for proofing. Take out the dough, knead it again on the floured surface for 5 mins. Rest it on the counter covered with a damp towel for 15 mins. In the meanwhile , grease your bread tin (8" by 4" ) with butter or oil. Now uncover the dough, pat it with hands in an approximate rectangle of 7 " by 6". Pick up the longer seam flap from one side and place it on the rest of the dough. Now pick up the other long flap and place it over the folded seam. You have to three-fold the two layers over each other. Brush some oil on top , also brush oil in a clean plastic bag in which you will place it. Let it rise in the tin for 45 -60 mins . Take out the baked loaf from the oven and allow it to cool in the tin for 10 mins. It will be hard to touch when it is fresh out of oven. 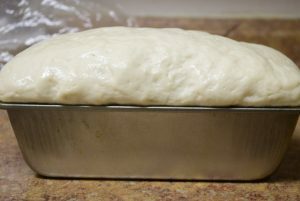 But don't worry after cooling, it will turn into a soft spongy, bouncy white bread. You may brush some melted butter on the top for a glossy look. Unmold the bread from the tin and allow it to cool for 2-3 hrs on the counter. I kept it in a plastic bag , so that it doen't dry while cooling. After 3 and half hours , I cut out the slices by inverting the bread upside down with a serrated bread knife. This entry was posted in Food, Main Course, Recipes, Snacks and tagged 3 to 4 hrs, all veg bread recipe, APF, butter, Carenshare, clairfied butter, delicious, flour, fluffy, fresh white bread, from my oven, ghee, in your oven, maida, milk, no egg wash, no eggs, no mustard oil, no preservatives, peanut oil, porous, shweta jindal, soft, spongy, sugar, vegetable oil, vegetarian, yeast, yummy, zindagisikhati.